My husband and I have always been fans of Randy Alcorn and his writings. His topics focus on questions that Christians frequently ask, but rarely are able to find bible answers. 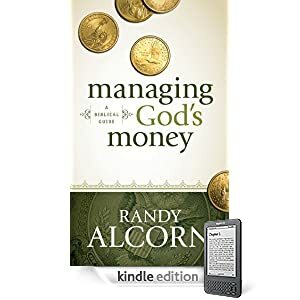 This new book "Managing God's Money" is a wonderful question - answer book by Alcorn about anything having to do with money. This book is written in a question and answer format with all of the questions under a similar topic grouped together. There are 6 different sections in this book, 22 chapters, and over 100 questions answered. Topics include "Tithing: The Training Wheels of Giving," "Materialism, Ten Fatal Dangers," and "Looking For Returns: Gambling and Investing." There isn't a question about money that I believe Randy Acorn doesn't address in this book. When we first received this book, I laid it aside in our office for a couple of days only to have my husband come to me a few hours later exclaiming "This book answered the question I've always struggled with and never had an answer to." He was referring to saving money for retirement. I would highly recommend this book to all Christians! I would also encourage anyone seeking scripture and books in regards to money to also check our Randy Alcorn's book "The Treasure Principle."